No matter what type of human you are, chances are you have a stressful life. Stress comes in all forms but the one I want to focus on specifically today is emotional stress. Frustration, anger & fear are three of the main emotions that messes us up as humans and can really put us in a rut. They are unexpected and if we don’t catch them when they arise they keep pushing us down, down into this well until we are so far down that it seems almost impossible to get ourselves back up. You see, our brain was designed to help us survive and sometimes it perceives the smallest hiccups as life-threatening situations. Your stress response triggers with an intensity you need to run from mountain lions when in reality you just got the bill for an expensive car repair. When you have life-or-death physical responses to issues that don’t require fighting or fleeing, it takes a toll on your body. While it may be difficult at the time to completely stop this type of stress from happening, there is one strategy that can help you manage it immediately. Breathing is a unique process in the human body. Unlike, for example, digestion, breathing has both an involuntary control mechanism as well as voluntary; it can shift between being piloted and being left on autopilot. Boxing breathing is a method I learned years ago from an ex-navy seal and I find it one of the best methods both practically, logically and neurologically. I practice this method of breathing on a daily basis either on it’s own or during my morning routines. Controlled breathing is an integral part of meditation and can be utilized independently to calm nerves and relieve stress by helping to regulate the autonomic nervous system, report researchers at the National Center for Complementary and Alternative Medicine. 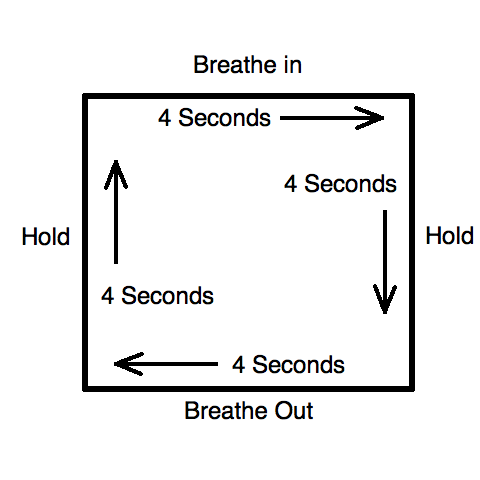 Box breathing emphasizes control through counts of four, which allows your body to make full use of the air. You also will work the chest and abdominal muscles slightly as you practice the box breathing technique. Sitting upright, slowly exhale, getting all the oxygen out of your lungs. Focus on this intention and be conscious of what you’re doing. Inhale slowly and deeply through your nose to the count of four. In this step, count to four very slowly in your head. Feel the air fill your lungs, one section at a time, until your lungs are completely full and the air moves into your abdomen. Exhale through your mouth for the same slow count of four, expelling the air from your lungs and abdomen. Be conscious of the feeling of the air leaving your lungs.